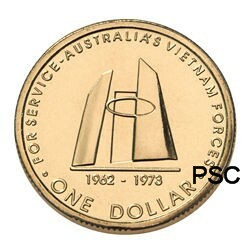 The Royal Australian Mint has released to honour the service personnel who served in Vietnam. Whilst it celebrates the service of our returned troops, this coin also pays tribute to those 519, who made the ultimate sacrifice in the service of Australia. 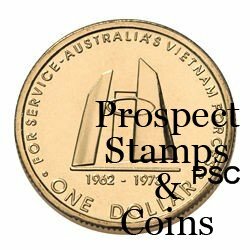 The style of the $1 aluminum bronze coin is intended to be contemporary, simple and clean. It's design echoes some of the major architectural and design elements of the Australian Vietnam Forces National Memorial in Canberra's Anzac Parade. The coin is packaged in a concertina type card, similar to the 'Victoria Cross' coin packaging. The packaging has a coloured picture of the Memorial taken at night. In addition, the mint commissioned a military historian from the Australian War Memorial to write an overview of the conflict which features on the card.